THE WRITING BUDDHA - Opinions | Books | Movies: The Notebook of Romance by Gargi Sarkhel Bagchi (Book Review- 2.5*/5)!!! The Notebook of Romance by Gargi Sarkhel Bagchi (Book Review- 2.5*/5)!!! 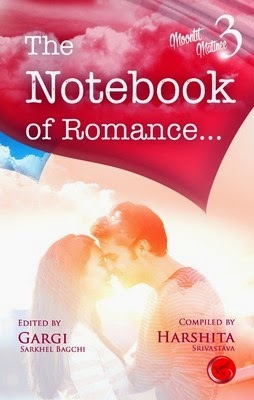 After reading an intense anthology by Gargi Publication, I went on to read a light and romantic anthology named "The Notebook of Romance..." published by the same publication house. This anthology has been compiled by Harshita Srivastava whose latest full-fledged novel, Bad Romance, is one of my favorite novels this year. And the stories are edited by Gargi Sarkhel Bagchi about whom I do not know anything as of now. This anthology is the 3rd part in the series of Moonlit Matinee which publishes short stories. The cover page is quite wonderful considering the theme of the novel. It's enough to catch a reader's eye. The stories are written in a very easy and understandable English which will be the key for its selling in market. The writers are vivid and of different age groups which gives different perspective to the stories. Some stories are very passionate while few are mediocre in fashion while some are purely a rewrite-kind of stuff. Few stories have amazing characters and situations which will remain in your mind once the book completes. For the readers of age-group 15-22, this book will work for sure as that's the age when you newly dive into this sea called love and thus every story will let you connect with this amazing feeling. Unfortunately, there is nothing very new in the book. All the stories are of similar fashion as we have kept on reading in all the anthologies that are getting published since last 3 years. After Crumpled Voices, I was expecting something new from The Notebook of Romance but I didn't get it. Yes, it's a fine book to take with you while traveling as it's a light read which will make you smile many a times. But it does not have any such moments which can act as an USP to it. Also, I felt 25 stories are too much for an anthology based on one topic. I give the book an average 2.5* out of 5. I hope Gargi Publication think of some artistic topics to base their anthologies upon like they have already proven rather than publishing series of short love stories. We have had enough of it.